Alex was drawn to the technique after reading Dr Wilfred Barlow’s book The Alexander Principle. Having come from a successful twelve year career in oil exploration this was quite a radical change but it was clear from Barlow’s book that Alexander had discovered something eminently useful and practical. Upon graduating from the first STAT authorized training school in Australia in 1985, Alex began a private practice on the lower North Shore of Sydney. Continuing his exploration of the mind/body dynamic Alex spent two years at the Drama Action Centre in Rozelle under the direction of Francis Batten and Brigid Brandon. During this time he was often to be seen at local markets and festivals performing a unique form of juggling called flower sticks, a variant of diablo. 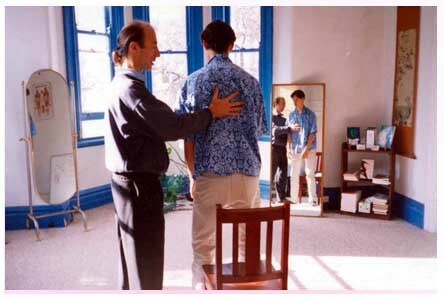 Alex began studying Aikido and Shiatsu in 1988 and reached black belt level (shodan) in Aikido in 1996. Since 1997 Alex has completed an award winning Graduate Diploma and a Masters of Applied Science degree in Social Ecology at the University of Western Sydney, Hawkesbury. “All of these activities have helped to expand and develop both my mind and my body. The Alexander Technique has been a fantastic underpinning for learning all these new skills which I never previously conceived I could learn. The Alexander Technique is definitely about opening and allowing new possibilities in life”. Alex’s private students come from all walks of life and span the age continuum from primary age children to his oldest student who was 93 when he started. These students share a common desire to live their lives fully and work in a constructive manner with restricting habits which exist for all of us at both the personal and social levels. For information on private lessons and introductory group classes held at Mosman Evening College Lesson information.